Young Clara will once again invite us inside her imagination with The Nutcracker, a beloved tradition since its premiere in 1892. There are epic battles, beautiful dances, incredible displays of heartwarming joy and the inescapable feeling that you have witnessed a holiday classic that has made audiences smile for generations. North Pointe Ballet’s production of The Nutcracker is an imaginative staging unlike you’ve ever seen it before. The holiday classic is brought to life through use of integrated live narration that guides those new to ballet through the story and enchants lifelong fans with thrilling theatrical elements and colorful larger-than-life sets and costumes. Congratulations to the cast of NPB’s Nutcracker 2018! Tickets are only $5 for groups of 10 or more. Please email us to reserve your tickets. This special performance will be a condensed version of Tchaikovsky’s full-length ballet, “The Nutcracker”, and include a post-performance Q & A with the professional dancers and choreographer. 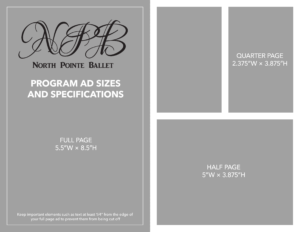 Plus, schools who book by November 1 will receive a study-guide packet to help educate their students on ballet, dance history, and characters and plot of the story. Performance will be held at the Lorain Palace Theater, 617 Broadway Avenue, Lorain, OH.